A 12-year-old girl began experiencing a wide variety of health problems a few weeks after returning from a fun-filled week at summer camp. The young girl’s symptoms included fever, headache, fatigue, and some minor joint pain. Her parents assumed she was suffering from the flu, as her symptoms were never too severe. Eventually, her symptoms progressed and she began experiencing severe joint pain and swelling. She eventually went to the hospital where she was diagnosed with Lyme disease. The reason it was not discovered until then was because a tick had bitten under her hair so the bite and rash remained undetected. Wisconsin and much of the Midwest are in the top 10 states for incidences of Lyme disease. If untreated, some individuals may develop arthritis, which can include severe pain and swelling of the joints. Also, neurologic abnormalities, including aseptic meningitis, facial palsy, motor and sensory nerve inflammation, and inflammation of the brain can occur. Cardiac problems are also known to stem from untreated Lyme disease. Wear light-colored clothing so that ticks can be spotted more easily and removed before becoming attached. Also, be sure to wear long-sleeved shirts and tuck pants into socks or boots, which may help keep ticks from reaching skin. Lastly, apply insect repellents containing DEET to clothes and exposed skin, and apply permethrin (which kill ticks on contact) to clothes. DEET can be used safely on children and adults but should be applied according to Environmental Protection Agency (EPA) guidelines to reduce the possibility of toxicity. Doing a final, full-body tick check at the end of the day. The American Lyme Disease Foundation reports that infected ticks begin transmitting Lyme disease around 36 to 48 hours after attachment. 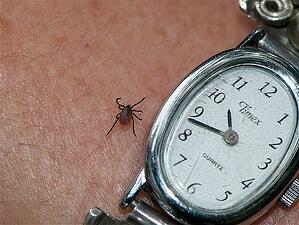 Chances of contracting Lyme disease are greatly reduced if the tick is removed within the first twenty-four hours. The majority of early Lyme disease cases are easily treated and cured. Using a pair of pointed precision tweezers, grasp the tick by the head or mouthparts right where they entered the skin. Do not grasp the tick by the body. Without jerking, pull firmly and steadily directly outward. Do not twist the tick out or apply petroleum jelly, a hot match, alcohol, or any other irritant to the tick in an attempt to get it to back out. 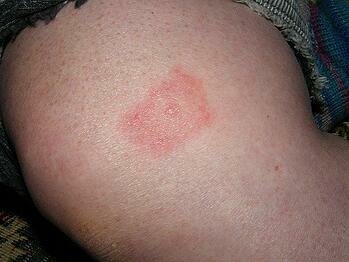 These methods can backfire and even increase the chances of the tick transmitting the disease.